FEATURING: MFA/MA in Collaborative Design/Design Systems: Kate Baker-Williams, Vitor Bastos, Mijounga Chang, Simone Crowe, Emilie Johnson, Audrey Lewis, Leah Payne, Katie Scott and Scott Sierra. MFA in Print Media: Schuyler DeMarinis, Kat Salvaggio, Shona Crawford, Taylor Leigh, Rich Conway, Quinnia Dubrasky, Travis Lober and Eirinn Gragson. 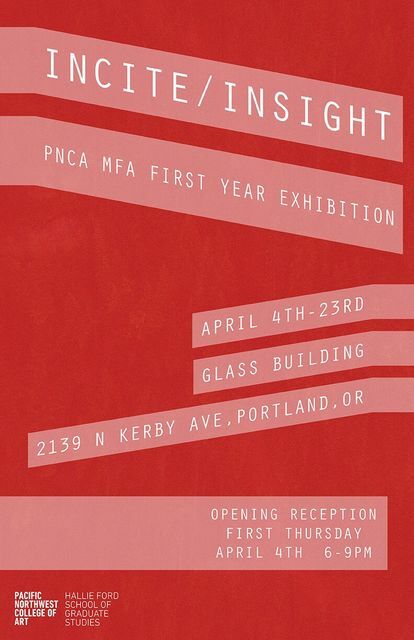 MFA in Visual Studies: Kristin Derryberry, Ashley Couch, Krista Cibis, Carly Naughton, Shelby Baldridge, Payton Barronian, Perry Chandler, KT Dimmick, Simone Fischer, Rachel Milstein, Mohammed Murshed, Frances Hanson, Daniela Repas, Matthew Perez, Sarah Peters, Isabel Salas, Shih-Ying Hu, Katie DeTemple and Anna Vo.